Now that I’ve been married for almost a month (holy heck, this month was the FASTEST ever), I wanted to share the second part of my honeymoon (first part: here). I want to make sure to get it down while it’s still fresh in my memory. Though I have to admit, now that I’ve been back for a week and a half, I feel like I’ve been back forever! Is it time for another vacation yet? Since the G20 Summit was happening at the Sheraton Hacienda del Mar during our honeymoon, they decided to move us to another hotel for a few nights. At first, we weren’t psyched about it, but then we realized it would be fun- like a vacation within a vacation! 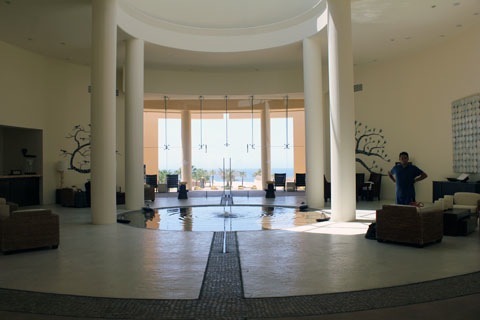 Plus, it would give us a chance to check out another resort in Cabo. 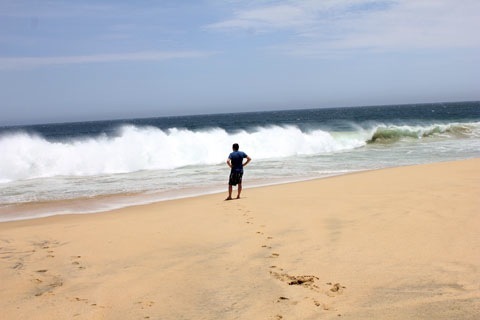 So, on Sunday morning, we headed a few miles away to Pueblo Bonito Pacifica. We had looked up the resort before going and not only did it look beautiful, but most people had nothing but good things to say. 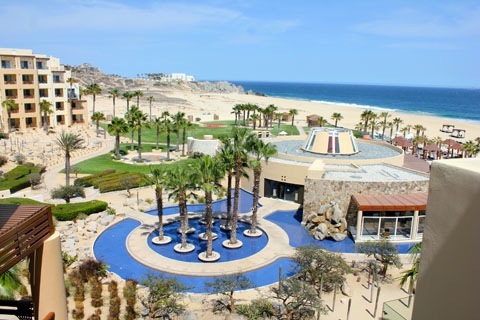 In fact, a couple days before we went, I randomly stumbled across this article entitled “17 Hotel Terraces with Unbeatable Views” from Conde Nast Traveler and was shocked to see the Pueblo Bonito Pacifica on there. OK, so maybe it wouldn’t be so bad having to move hotels. It wasn’t. The lobby was absolutely stunning and instantly made you feel relaxed. While our room wasn’t quite as luxurious as the one at the Sheraton Hacienda del Mar, we had a sweet balcony with a stunning view. Ahh, vacation. I love how tan and happy we are. Why can’t it be vacation ALL the time?? OK fine, I guess that wouldn’t be as fun. 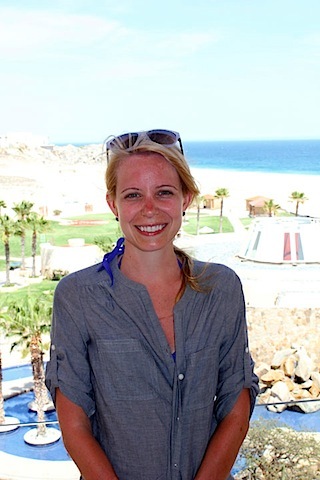 What was our favorite thing about Pueblo Bonito Pacifica? Most definitely the beach beds! These were seriously heaven. If you had a suite at the resort, you could book these for free. Otherwise, they cost $30 a day to rent. Which is 100% completely worth it. Basically, you get a bed on the beach, plus lounge chairs, plus a waiter/waitress who comes whenever you put a flag up for them. Lounging here was one of my favorite parts of the whole vacation. In fact, it was probably one of the best days ever. I enjoyed the resort’s sangria, which was basically red wine mixed with lemonade (lazy man’s sangria?). And the beautiful ocean view. It was completely refreshing and hit the spot on the super hot day we spent on the beach. 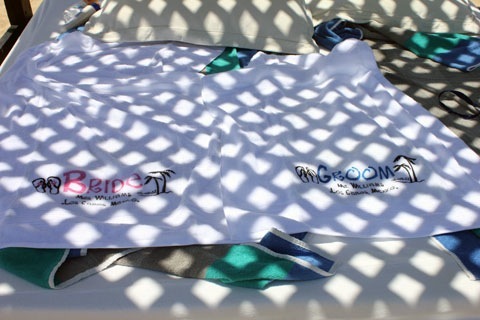 We utilized our lovely bride and groom beach towels that my bridesmaids got us! 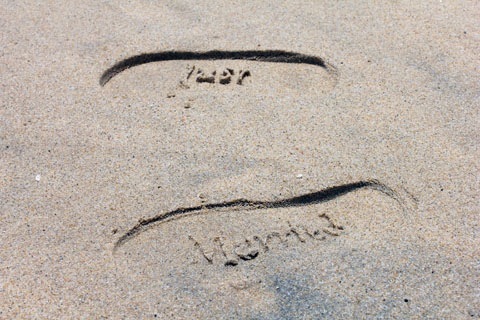 And walked around in our “just married” flip-flops. Since the resort is on the Pacific, the waves are HUGE and you can’t swim in the water. It also seemed to get quite windy in the evenings. But I think we were there during an especially windy time. 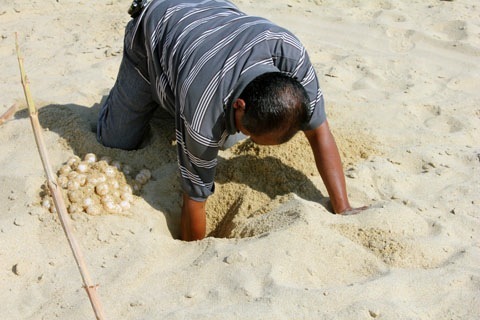 During our day on the beach bed, we spotted a man digging up turtle eggs and learned that he was digging them up to move them to a safer area. I guess this is quite common on the beaches here. We wanted to come out to see the turtles later that night, but ended up missing them. 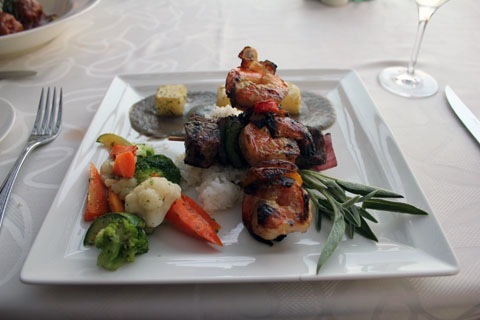 Chris and I also enjoyed a few fabulous meals at Pueblo Bonito Pacifica. We found some of the food lacking a bit, but I think it was due to the all-inclusive package they have available. Generally, all-inclusive packages don’t do anything for me because food is majorly blah. 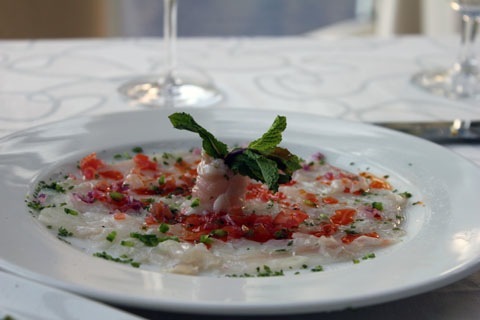 The food at this resort was definitely better than most places with all-inclusive deals! But since we weren’t participating, we wanted a bit more. However, one of their restaurant’s, Siempre, was absolutely fantastic. You can sit outside (but still be covered) and enjoy a pretty resort view. 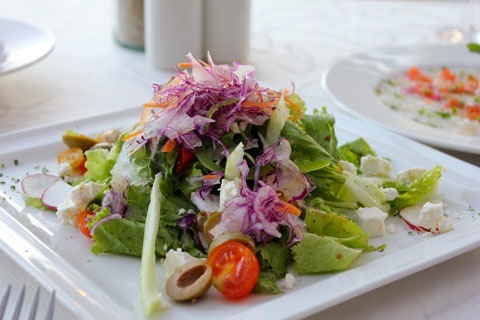 I was craving veggies and loved Siempre’s Greek salad. We also shared the parrot fish with jalapeño appetizer. 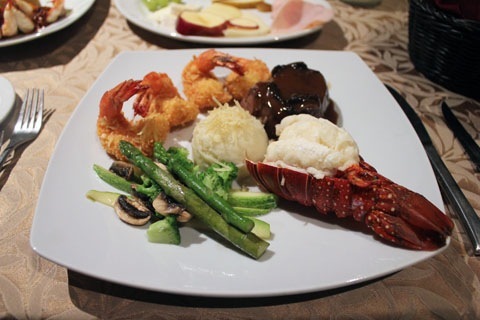 Chris loved the surf and turf and its beautiful presentation. 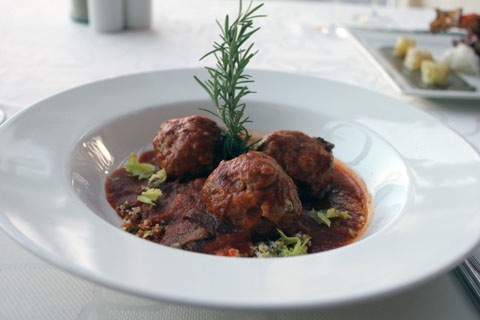 I was a big fan of the veal meatballs. 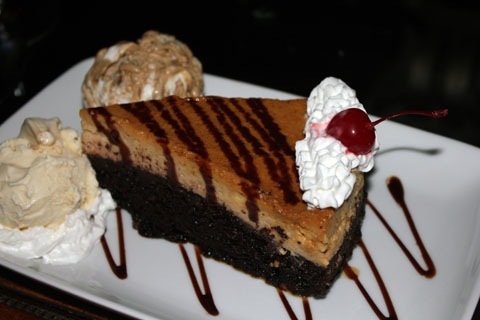 We rarely seem to agree on dessert, which means we always seem to get two. I’m OK with that. We ordered the cheesecake. And the flan. Which they served along with a shot of tequila. 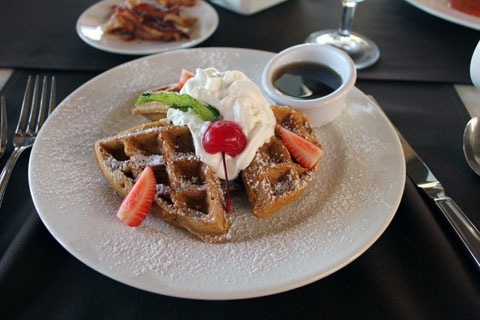 We also really enjoyed Siempre’s breakfasts and Chris ordered these waffles every single morning. Fabulous way to start the day. 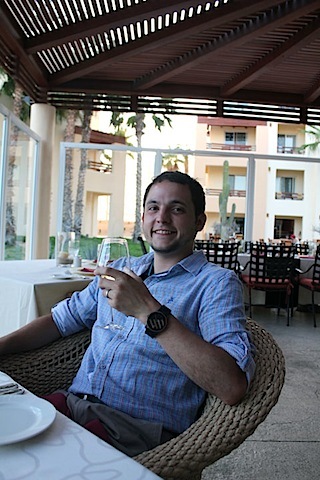 We planned on eating dinner on the beach during one of our night’s at Pueblo Bonito Pacifica. We thought it would be incredibly romantic and perfect… Until the evening before when we watched another couple having dinner on the beach. It was SUPER windy. The couple was wrapped in a blanket and holding tight to their drinks, with sand flying. We decided it probably wouldn’t be so romantic. Again, I think we were there during a particularly windy time, so any other time would have been fabulous. But we decided to cancel our reservations and rent a car to seek out something outside of the resort. And away from the wind. I did a bunch of research to try to figure out where we should go and discovered a little winery that had fabulous reviews on Trip Advisor. So, we hopped in our car and searched for it. Warning: stop signs in Mexico are basically just suggestions. And driving can be a tad scary. 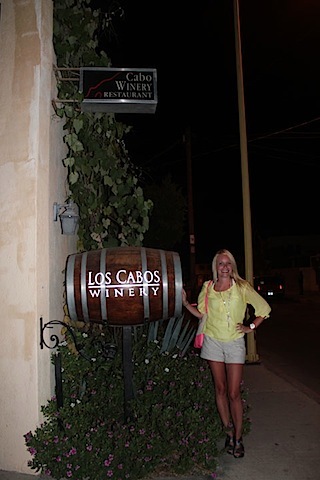 But we made it to Los Cabos Winery and could immediately tell we were going to love it. They showed us around and let us decide where we wanted to dine. We chose the cave. There was only one other party there when we arrived and within 10 minutes, we had the place to ourselves. 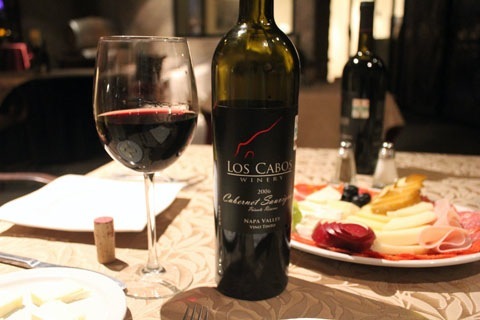 We ordered a bottle of Los Cabos Winery’s Cabernet Sauvignon. 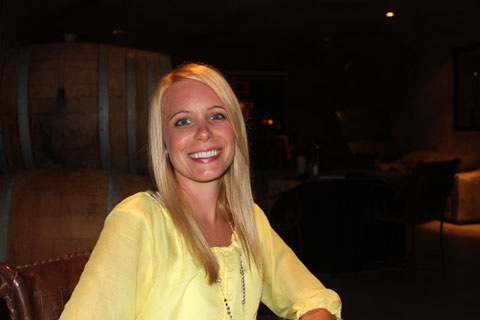 The grapes were sourced from Napa, but the wines are barrel-aged at the Los Cabos Winery. 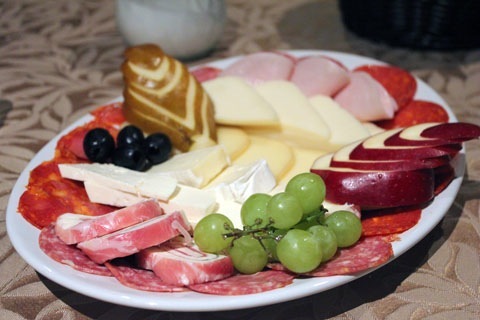 We also had one of the best cheese platters ever. 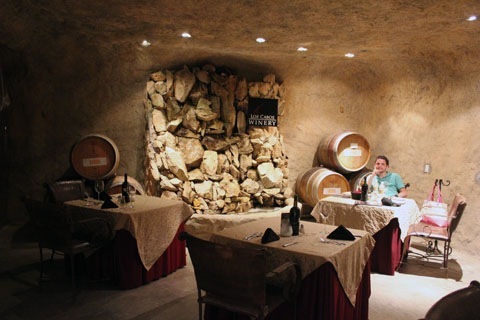 We had already read online what to order (from the rave reviews), and the party dining in the cave when we first arrived confirmed the recommendations. Chris ordered the turf and two surfs (with coconut shrimp). 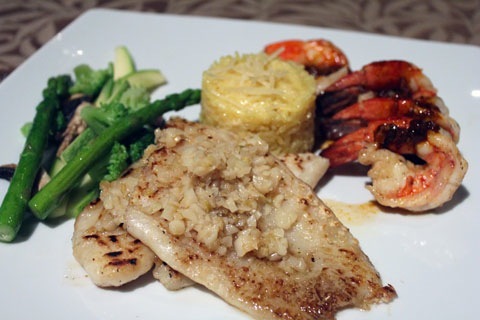 And I got the sea bass with garlic and ginger and chili-garlic shrimp. One of our best dinners on vacation! 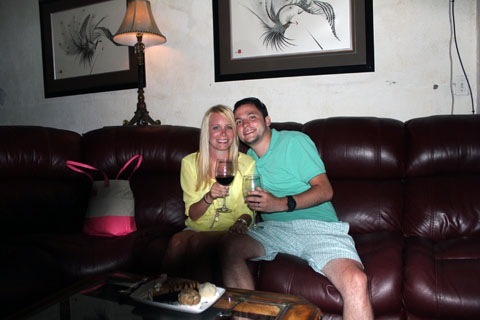 We were both pretty thrilled we canceled our beach dinner to enjoy an intimate and delicious meal in the cave of a winery. When we were finished eating, the owner of the winery came out to say hello. 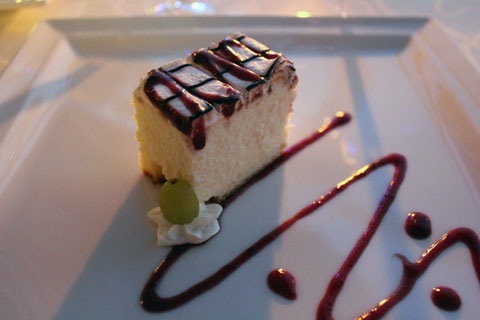 When Robert found out we were on our honeymoon, he ordered dessert for us. He told us we could enjoy it in the lounge area, where they had nice comfortable couches. So, we did. We ended up sitting for over an hour with Robert and chatting with him about his business and life. We seriously felt like we were sitting in someone’s home, just hanging out and relaxing. We almost moved in. 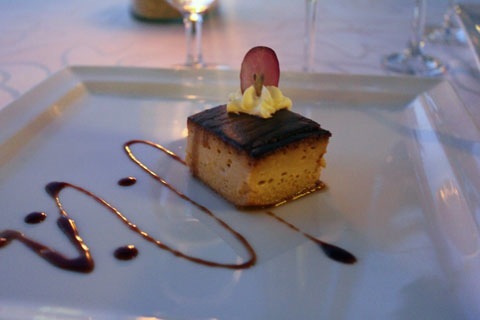 Oh, and the chocolate cake flan was pretty fabulous, too. Thanks to Robert and everyone else at Los Cabos Winery for a perfectly amazing dinner and evening. 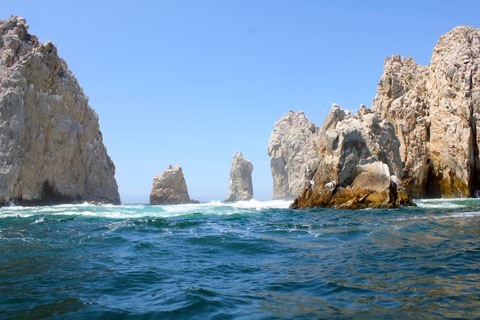 Next time we visit Los Cabos, we’ll definitely be back! One other little adventure we had during our honeymoon was our trip to Lover’s Beach. 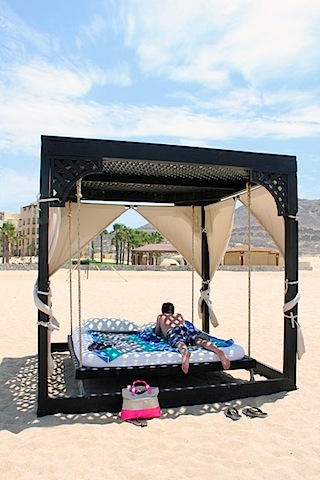 This beach has landed on many “most romantic beaches” lists and must-see in Los Cabos. 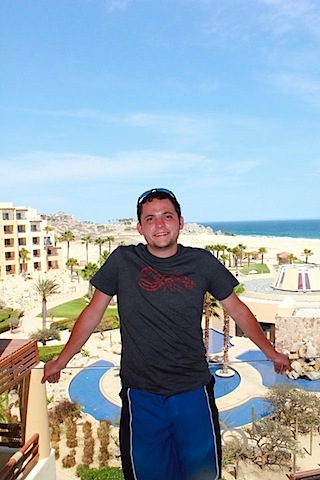 We booked a tour through Panchito Tours, which also included a little tour of the downtown Los Cabos area. We got to check out a lot of cool things we wouldn’t have been able to see if we didn’t take the tour. 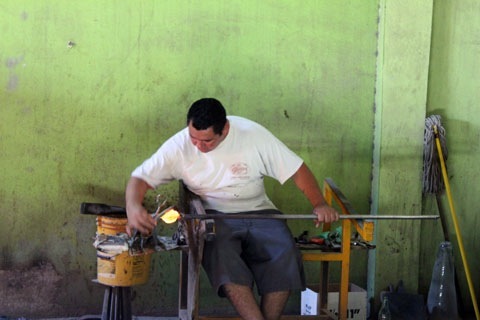 Including a glass-blowing shop. 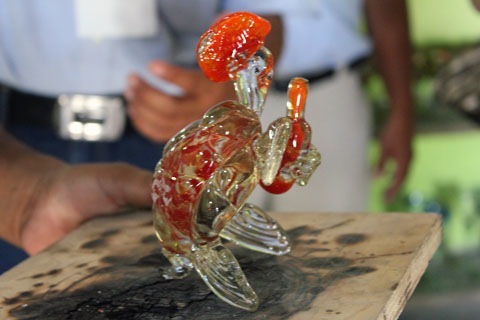 We watched them make this turtle from start to finish. Which Chris then immediately purchased (because we have SO much space in our apartment for a turtle wearing a sombrero and holding a bottle of tequla- haha!). I wanted to buy pretty much all of the glassware, but knew we’d have no way of getting it back to the States. We also visited a tequila shop where we got to sample a bunch of Once Letras flavored tequilas. Yum. 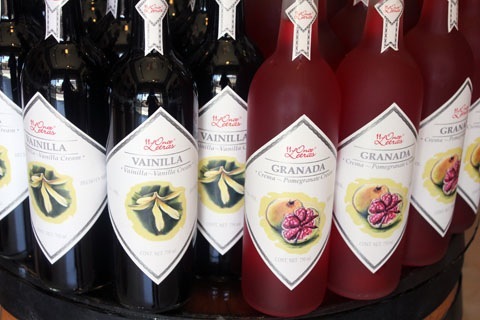 Even if you’re not a big tequila fan, I think you might light vanilla tequila. I could definitely see myself pouring some on the rocks and sipping it in the summer. I wish we could have taken several bottles home, but again, it’s tough when you’re traveling. I wish we could get this in the States! 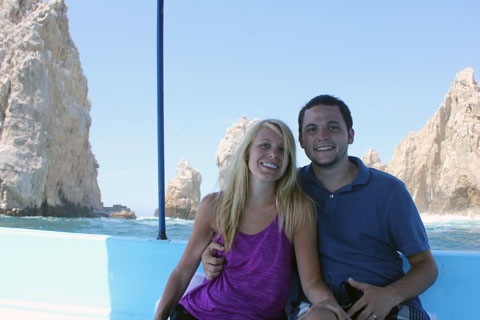 Lastly, the tour included a glass-bottom boat ride to Lover’s Beach! We were psyched for this. But um, the water was a bit rough. You should see the series of photos we have where our tour guide was trying to take a photo of us, but since the boat was bumping up and down so much, he couldn’t get us in the frame. This was the best. 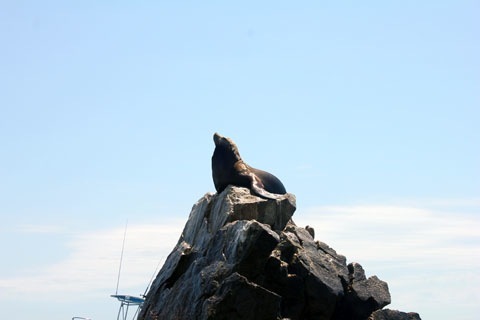 We got to see a super cute sea lion, though! And the really beautiful waters and rock formations. It looks so nice and calm here. It wasn’t. We made it to the beach and got all ready to go snorkeling. Our tour guide said the water was unusually rough and cold and that it’s generally much calmer and a bit warmer. I’m the biggest wuss when it comes to all things water-related, so I was a tad bit scared to go snorkeling. I think our guide could tell, so he got on his snorkeling gear and came with us. He helped me get past those initial big waves. And once we were in the water, i was feeling much better. Cold, yes, but we got used to it. We didn’t see a TON of fish, but the ones we did see were pretty beautiful. We swam around for a while and Chris jumped off the big rock formation you see below. I did not. We also spent a good amount of time exploring the beach, which was absolutely beautiful. 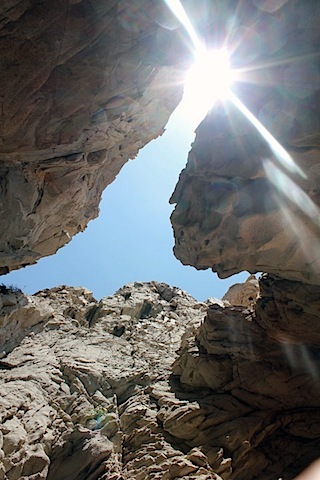 Especially with all of the rock formations. Unfortunately, the only photo we have of the two of us on Lover’s Beach has a huge cruise ship int he background. Uh, not quite so romantic. Our tour with Panchito Tours was one of the last things we did on our trip and was a great way to bring it to an end. Everyone at Panchito Tours was awesome and made sure we had a ton of fun. And we have to give a huge shoutout to Rolondo who helped us feel totally comfortable snorkeling in those rough waters. 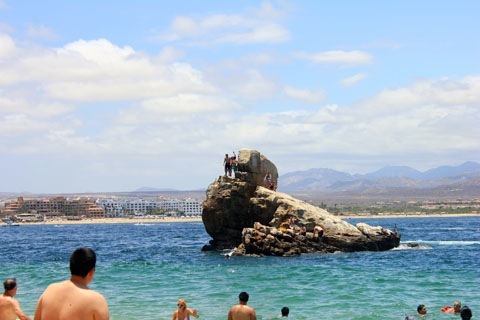 Those are just a few of the major points from our honeymoon, though we did SO much more during our 12 days in Los Cabos. I still cannot believe it’s over, but I’ll never forget how much fun we had and how completely relaxed I felt the entire time. It makes me really excited for the rest of our lives as a married couple and the upcoming incredible trips we’ll be taking together. 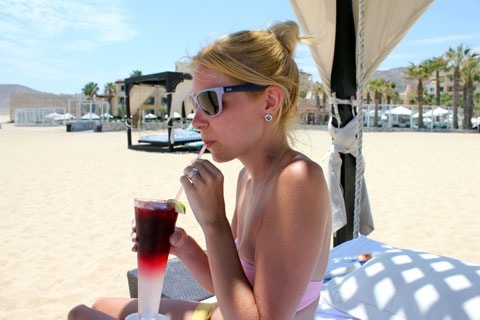 And I’m sure we’ll be back to Los Cabos sometime soon. Because it was that perfect. What was your most perfect vacation? 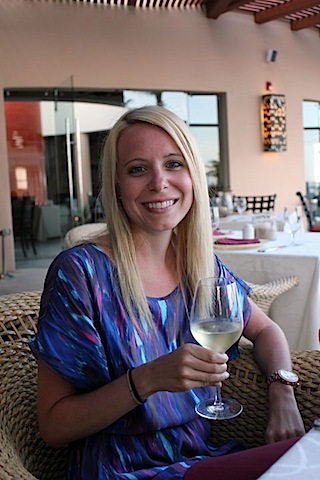 14 Responses to "Honeymoon in Los Cabos, Mexico (Part 2)"
oh what a great vacation!!! you both looked so relaxed! You both look great! Plus everything about the vacation looks so much fun. The food at the winery made me swoon! Congratulations, Sues! What a beautiful place. 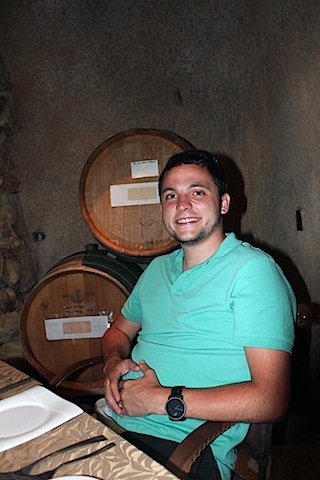 Suntans, beach beds, wine cellars…What’s not to love about this trip?! Congrats again! I can’t believe it’s already been a month! 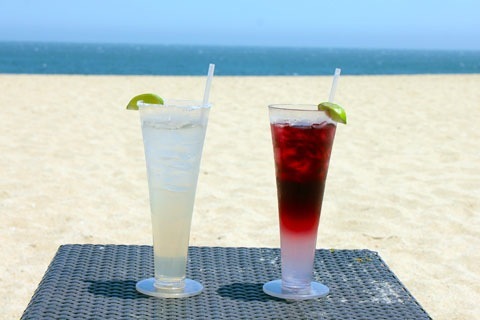 Love that beach bed, and those drinks look pretty awesome too! What’s not to love about this whole vacation/honeymoon? Thank you for taking us on this fabulous excursion…would any of us not want to partake of of this once in a lifetime experience? I think not. Oh wow! Congratulations! This honeymoon looks like bliss! I am glad you told me to check out this site. How beautiful everything was, including the two of you. You both looked so happy, rested and relaxed. I couldn’t be happier for you! The trip, the food, your tan…awesome!